Josh Hamilton hit four homeruns on Tuesday night. What do homeruns have to do with Christian community? 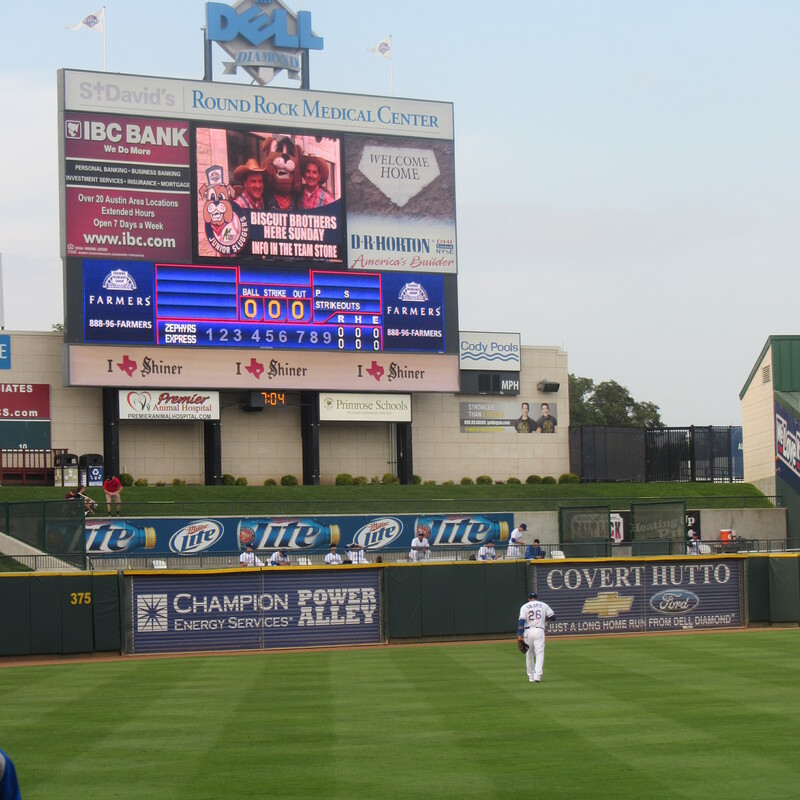 Outfield scoreboard at Dell Diamond. If you want to know more about Josh Hamilton’s accomplishment and to find out where I was on May 23, 2002, follow this link to Cliff Corcoran’s write up (Bonus points for the first person who figures out my whereabouts and comments). 1) A healthy connection generates joy. If you’re puzzling over “generates,” don’t work too hard on it. I just like alliteration (plus the word isn’t as cliché as “multiplies”). Josh Hamilton’s four-homerun night awakened my May 23rd memory (now almost a decade old). What makes the memory all the more special is the presence of two friends, my son, and his friend. 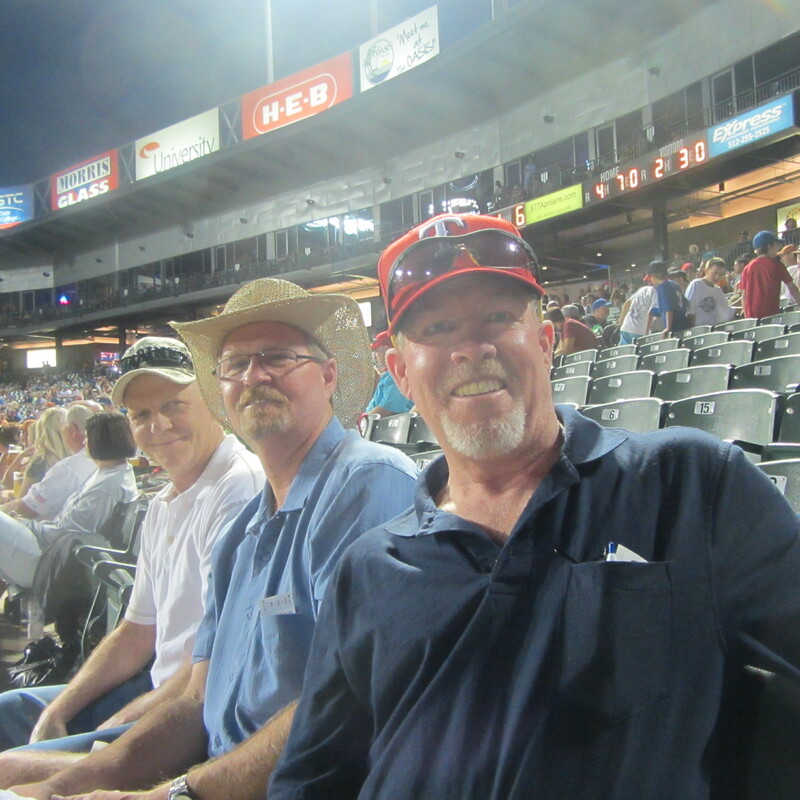 Last week, my brothers and I attended a Triple-A game at Dell Diamond in Round Rock, Texas. The previous week, all by my lonesome, I watched a Double-A game at Whataburger Field in Corpus Christi. I enjoyed both experiences (after all, it was baseball) but I enjoyed the former more than the latter because I went with Wayne and Roger. Roger, Wayne, and I in the stands at Dell Diamond. I find the same thing holds true in my walk with Christ. I enjoy the experience all the more when I have a healthy connection with my brothers and sisters in the faith and we journey together. 2) A healthy connection shares sorrow. My brother Roger was diagnosed with stage 3 lung cancer this spring. The news rocked our family. As a family, we entered into Roger’s tough news and stood together in carrying the burden. “… better a neighbor nearby than a relative far away” (Proverbs 27:10b NIV). As much as I love my family, I still need healthy connections with the people who are near me. That starts at home and expands to my church family and my community. This proverb reminds me of the importance of being present with those in pain. “The person who shuns the bitter moments of friends will be an outsider at their celebrations” (Proverbs 14:10 The Message). 3) A healthy connection encourages. With my father watching from the sidelines, I had my best football game in high school. The local paper listed my name among several outstanding players. His presence encouraged me to play above the norm. As followers of Christ, we encourage one another to pray, to study, to grow, and to live out our faith together. 4) A healthy connection aligns hearts through accountability. That’s the one. My apologies to you Ford owners. The slogan is familiar and it addresses a specific healthy choice—to not drive under the influence. On the other hand, it also illustrates the power of accountability. When we live in healthy connection, we encourage making better choices. We hold each other accountable to a lifestyle befitting the gospel of the Lord Jesus Christ. We align our hearts with His character. I’m curious. What benefits have you experienced through healthy connections? 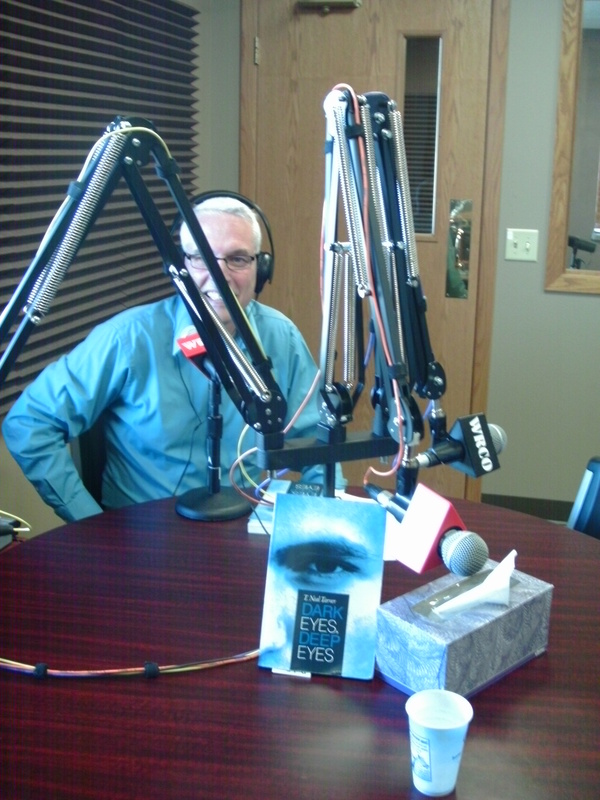 “Dark Eyes, Deep Eyes” goes to the radio station for an interview with my friend Ron Fruit (he’s the one behind the mikes). This entry was posted in Community and tagged Baseball, celebration, Christian faith, community, Dell Diamond, family, Friends, Grief, Home Runs, John Maxwell, Jon Stolpe, Josh Hamilton, Minor League Baseball, Whataburger Field. Bookmark the permalink. Great post! I think you illustrated community in a way that is easy to identify with! I do also expect an apology to us Ford dealers as well. I will be sitting here waiting! As for your whereabouts on the given date, I am guessing you were in Milwaukee watching a baseball game. If I remember correctly, it was roughly 60 degrees and slightly breezy at the start of that game. Just one more connection for you…Mike Cameron (Seattle) hit 4 three weeks earlier. He and I went to high school together! Ah, a name dropper. Yep, I remember Cameron hitting four home runs earlier that month. A 4-homer game from an individual player is unusual. Two in less than a month is unheard of. To think only 16 players have mastered that feat in a 100+ years of Major League Baseball and 12.5% did it in May 2002. I will though buy you a milkshake whenever we’re in the same area code for being the first to comment. In case you have forgotten, you already owe me a coffee as well. This first meeting is getting expensive for you! I am laughing out loud at Starbucks! Thanks for the chuckle! Great post! Anything community related draws me right in. I put good articles away in a special file. Yours was a natural one to share with the Curious folks here. Appreciate your work a great deal. Healthy connections can help save a marriage and raise a godly child. I know, that’s big stuff, but it’s on my mind today. Successful marriages and godly parents with godly kids usually don’t happen in the absence of healthy connections for support, encouragement, advice, accountability, etc… I know I didn’t make a baseball connection in my comment, but maybe it counts that I at least knew who Josh Hamilton is (his story is very inspiring). Good stuff, Kari. You’re right that successful marriages and godly parenting don’t happen simply because two people like each other a lot. Healthy connections with others empower husbands, wives, and parents to live deeper, fuller lives. And although this post starts with Josh Hamilton, it’s not a baseball article. It’s about community (which is what you commented on). Excellent!